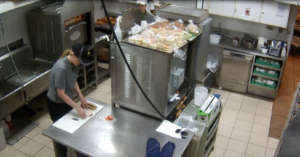 Installing a new video surveillance system can be a time-consuming task, especially if you have a large customer with multiple locations. Depending upon the number of devices you’re installing, it can take anywhere from several hours to several days to complete, so it’s important to get things right. The last thing you or your customer wants is for you to have to make return visits to change system settings or camera field of views because devices weren’t properly configured at the outset. Not only does this cost you money, but it can jeopardize your relationship with your customer. So how do you guarantee a quality video surveillance installation the first time around, especially during multi-site installations? 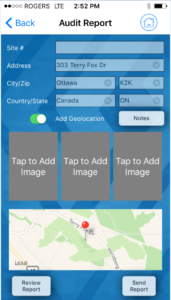 If you’re a March Networks certified partner, you can easily document your video installations, including each location’s network details, storage and device information, with a few taps on your smartphone or tablet. Our GURU Smartphone App’s new Installation Audit report lets you take a comprehensive snapshot of your entire video surveillance installation that you can review for accuracy and consistency, and also use for future reference. 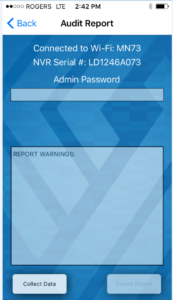 The report captures important details like site address, product/device names and serial numbers, and network names and IP addresses. 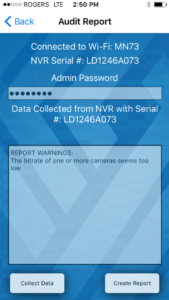 It also captures camera data rates, video resolution and bit rates, and even a thumbnail view from each camera on the network so you can verify that the correct field of views are in place. The Installation Audit report is automated, so you don’t have to manually enter information into your phone. It works by connecting GURU to your March Networks network video recorders (NVRs) through WiFi, and then extracting the above data. GURU automatically packages this data into a convenient Microsoft Word format you can email to yourself, or to your customer or supervisor, to confirm the installations are correct. The report is especially valuable if your business is working with sub-contractors on large, multi-site installations because it allows you to confirm quality and consistency at each location. 1. 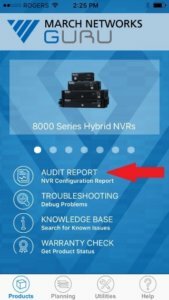 Open GURU and navigate to the 8000 Series Hybrid NVRs page (or RideSafe product page, depending upon which March Networks NVR you’re using.) (See Figure A below.) Click on the Audit Reports icon and login to the March Networks Partner Portal. 3. 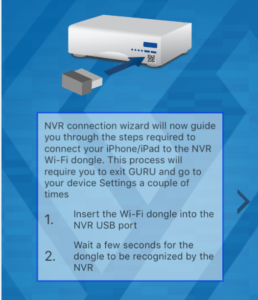 Next, GURU will ask you to verify your WiFi connection to the NVR. 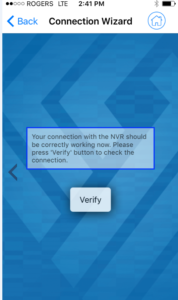 Hit “Verify” to see if you’re connected. You should see a message confirming your connection. (See Figures C1 and C2 below). If you’re not connected, go back and check that you completed the connection steps correctly. 4. 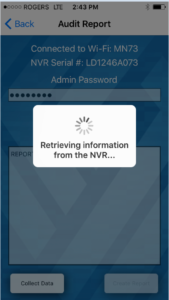 Once you’re connected to the NVR, GURU will ask you for the recorder’s admin password. Enter the password and then tap “Collect Data”. GURU will now begin collecting data from the NVR. (Figures D1 and D2 below). 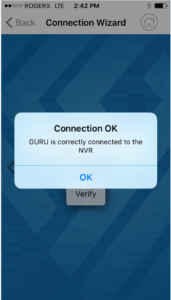 This process can take several minutes as GURU retrieves information on all the devices connected to your recorder. 5. Once GURU has finished, you should see a message indicting that data has been collected. (Figure E below) You can now proceed to creating your report by tapping the “Create Report” button at the bottom right hand side of the screen. 7. You can now review your report and email it to yourself, your customer or someone else on your team. As stated, the Installation Audit report itself includes detailed network and device information. Each device name will be listed, along with its status, model, Mac address and firmware level, as well as resolution, codec, bitrate and frames per second. You’ll also see a thumbnail image of the camera’s field of view. See example below in Figure G.
Now that you have your report, you can review the information to ensure the installation is correct and make any adjustments needed. Once you’re done, you can email a copy to your customer for their files. Want to learn more about other great time-saving tools offered in GURU? Visit our website or download the app from the App Store or Google Play to try it for yourself.